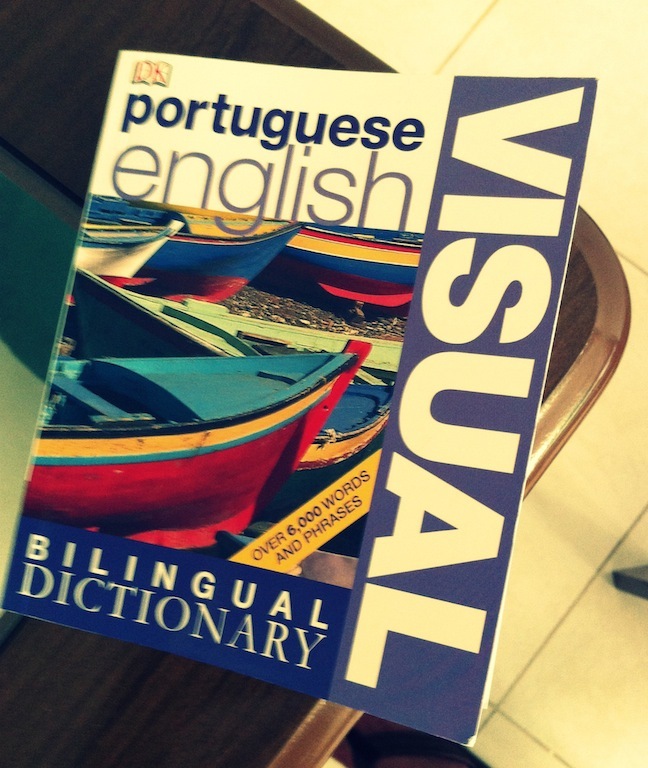 My visual dictionary has been a huge help as I explore Brazil. I mentioned in an earlier post how tough it’s been to get around in Recife, Brazil without knowing Portuguese. The fact is that Americans are very fortunate when it comes to traveling the world. Many destinations are accommodating to the English speaker. For instance, taking the tram in Athens, Greece by myself wasn’t as bad as I thought because below the directions written in Greek is the English translation. Many menus throughout Italy had an English section making it easy to order food. The point being that most people know at least a little English in popular tourist destinations around the world. My problem is that I am not in a popular tourist destination. During my first weekend here I did not hear a single word of English. When I tried to communicate with a waiter or cashier the only thing I got was a look of confusion. – Do you speak English? : *Fala ingles? This can be a scary thing because you don’t want to butcher the language and/or embarrass yourself. I made a point of learning the Portuguese word for “chicken” because I don’t eat beef or pork but when it came time to use it I completely froze. The longer I spend here the more comfortable I get using the few words that I know. Make a point to smile and nod at people, let them know that you are happy to be there. Once you learn basic phrases you can exchange pleasantries in passing. I am proud to say that when I am leaving my apartment building in the morning I can greet people in the elevator and wish them a good day. That’s a long way from freezing up at the thought of having to order chicken. Don’t start off a conversation with “Do you speak English”. First greet them in their language and wait until you can’t understand them. I’ve found that making an effort goes a long way. Don’t get visibly frustrated because someone doesn’t understand you. You are in their country. At a cafe the other day I practiced the phrases I would have to use to order a coffee with milk but when I actually ordered there was a problem. I’m not sure what the cashier was saying but apparently what I wanted wasn’t available (perhaps they were out of milk) so I simply ordered a cappuccino instead. No big deal. Getting frazzled about the situation would have done no good and made me come off as rude. Once you have it bring it with you when you go out. I bought an awesome visual dictionary where I can point to pictures if I need to. When I’m at a cafe or in a taxi I’ll take it out and study new words. It’s also acts as a type of comfort blanket. I know that if I never need an ambulance I can pull out my visual dictionary and point to the appropriate picture. I hope that’s never the case but it’s nice knowing I have the book if I need it. Look for a program to help you build your skills. I just signed up for a Live Mocha account where I can learn new phrases via writing and matching exercises. You can also practicing speaking the language and fellow users will critique your process. If you want to advance past basic phrases then an interactive program will be best because you can learn pronunciation and dialect. It is still tough to get around but it feels good to know that I am making an effort and giving the people around me the respect of making an effort to use their language.